Why do I need to access the router’s web interface? 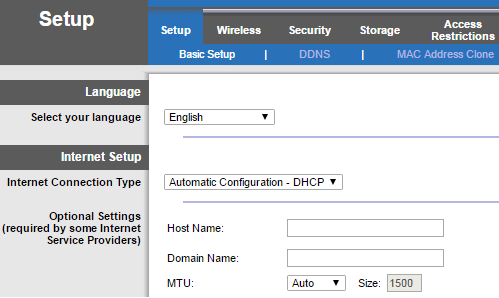 Learning how to access the router’s web interface is important especially if you want to configure advanced settings. Some common configurations that can be done on the page are to set up a wireless security for your network, forward ports for your game console and video camera, and set up your Linksys router manually. It is recommended to use a hardwired connection from your computer to the router in accessing the router’s web interface to ensure stable connection and avoid possible access to other Linksys routers in your area. ​NOTE: The Linksys routers have auto-sensing capabilities and don't require the use of cross-over or straight-through cables. If you are using a wireless device to access the web interface, make sure that your device is connected to your Linksys router's Wi-Fi before following the steps below. Before accessing the router’s web interface, make sure the router is powered ON. The router password, also known as admin password, is used to access the web interface. If you forgot this, you will need to Reset the router to its default settings. To learn how to reset a Linksys Wi-Fi Router, click here. If you are using a Linksys Smart Wi-Fi Router, click here. NOTE: Images and steps may vary depending on the Linksys device you are using. Launch a web browser and enter “192.168.1.1” in the Address bar then press [Enter]. If the IP address does not work or if it has been changed, check your Linksys router's IP address. For instructions, click here. Enter your login credentials in the fields provided. The default password is admin. If you changed or personalized your password, use that instead. 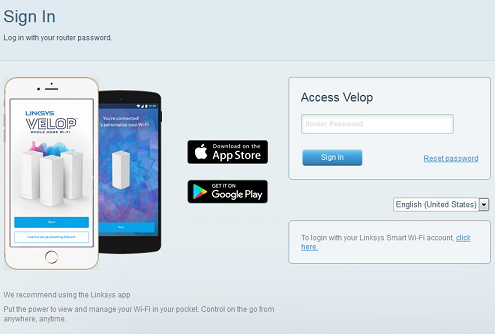 For Linksys Smart Wi-Fi Routers, the login page will appear differently. To learn how to access your Linksys Smart Wi-Fi through a web browser, click here. If you are using the Linksys Velop Whole Home Mesh Wi-Fi System, click here for instructions on how to access its web interface. QUICK TIP: If you encounter login issues or error messages while using your Linksys cloud account, click here for troubleshooting steps.